With the financial success of the live-action Transformers movies, Hasbro sought to reboot their animated presence with a new show that not only re-imagined the Transformers and their world, but to place it far outside the shadow of Gen-1. While Gen-1 was being honored with the Classics line, a new animated series would go live on Cartoon Network. Transformers Animated would deviate heavily from previous incarnations of the franchise, depicting a small team of military washouts trying to protect the AllSpark while stranded in Detroit. While it was determined to be a new show, it did still take cues from numerous past iterations: the show was replete with subtle (and some not-so-subtle) references to the Gen-1 continuity, while also incorporating elements from Beast Wars and the Unicron Trilogy. Starscream, being re-imagined along with the rest of the franchise, took his place near the top of the villain pecking order. Early on, he is established to be THE main villain before Megatron’s presence is finally felt and he returns throughout the series, showing every bit the guile, manipulative intelligence, and outright vicious might, he was stated to have in Gen-1 (but showed less and less of as the series went on). Transformers Animated had a decidedly more cartoon-y feel to it, eschewing the increasing anime look of the Unicron Trilogy, and embracing a more American animation aesthetic. Starscream was thus redrawn with a highly stylized look and feel that visually captured his own nefarious nature. The toy very nicely captures the look of Starscream from the show, down to the claw-like fingers and the rakish smile. The proportions of the limbs are especially worth noting because of how stylized they are in the series and how those proportions were successfully transferred to the figure itself. 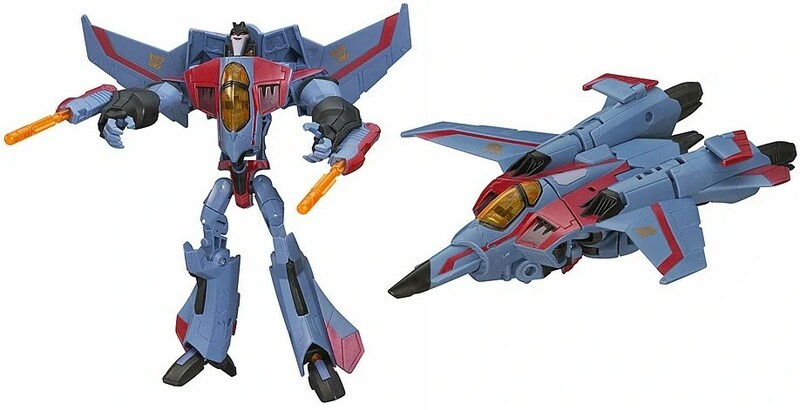 The one shortcoming of its look is in jet mode, where the bulk of the ship doesn’t jive with the sleek slenderness found in Starscream’s jet mode in the show, though this is a reasonable concession for the human form’s otherwise spot-on appearance. Hasbro has a reputation for really rugged toys, but this line had to make some compromises. The plastic used to make the toys feels a little thin at times and joints are noticeably lacking in strength. This toy doesn’t quite have the heft to it you might expect and, holding it at certain angles, can make it seem almost flimsy. Make no mistake, it’s perfectly adequate – good even, when compared to other toys – but falls a little short of Hasbro’s otherwise usually high standards. In humanoid mode, the toy moves nicely, with a lot of great action poses possible. In truth, the figure is more poseable than many action figures. The transformation sequence is especially smooth, in many ways feeling almost automated. Pull the nose of the ship forward and the arms and legs swing back almost on their own, making the figure transform in almost a single move. The figure comes with two missiles that it fires out of its arm cannons, but otherwise includes no other additional weapons or trinkets. As stated previously, this is appropriate for the character but still is a let-down. The Animated line’s packaging was quite good, though a little pastel. Not anything wrong with pastels in and of themselves, but they can make for indistinct packaging art. The boxes were otherwise very sturdy and distinctively shaped, and included character information and story notes, all of which added to the experience of purchasing the toy. This toy was right on the cusp. Giving it a four feels overly generous, but giving it a three feels unfair. It’s firmly right between an adequate toy and a good toy, but it definitely isn’t great. The look and transformation process is definitely to be praised, but the construction quality is lacking (again, at least compared to Hasbro’s standards) and the lack of additional attachments or weapons is more noticeable than usual here. Seems to be a decent piece. God review! Thanks for sharing!